An interview with Dave Gilbert of Wadjet Eye Games, creator of the Blackwell series and The Shivah. Hi Dave, let's begin with an introduction of yourself, and what you do. Sure thing. My name is Dave, and I'm an indie game developer from New York City. I started writing freeware games back in 2001 and in June of 2006 I decided to give the commercial thing a whirl. A year and a half later, I'm still making them. At the moment I'm working on the 3rd game in the Blackwell series, entitled "The Blackwell Convergence". It's a return to the present day, meaning you'll see Rosangela again instead of Lauren. Any side projects? Or are you currently fully committed on Convergence until it's completed? Is there a rough release date already for the third chapter in the Blackwell series? There are a few other things I am working on, although they are more "cool ideas in the back of my head" than anything else. I am aiming for around February of next year for Convergence, although it's a verrry rough estimate. The game was already designed and plotted out when Unbound was done, so there will be a significantly smaller wait this time around. The majority of the work always happens in the last month. It is a bit optimistic, but the deadline gives us something to shoot for. We might be late, but without some kind of guideline it would never get done. Although I did say February was "rough". I haven't actually announced a deadline yet! That was the first lesson I learned from Legacy, heh. You had mentioned that there would be five games in the Blackwell series. Is that still true? Do you have an ending written for it already, as a closure? And will there be another game featuring Lauren as the main playable character? If not, is she going to make an appearance in any of the upcoming chapters? The "five games" thing is a bit of a guideline for myself. There are five main backstory/plotpoints that I want to hit, and so I've wrapped each one in its own game to make them all digestable. Sometimes we might take sidetrips, like we did with Unbound (which was originally supposed to be part of Convergence and doesn't count as part of the "main five"), so in the end there might be more than five. I do have an ending in mind, yes, and I know what will happen along the way. There might be sidetrips if I get a neat idea or somesuch, but for the most part I'll be sticking to the path I've laid out. As for Lauren, she'll always be an ever-present figure, whether she's the main character of the game or not. She was a major part of both Joey and Rosa's lives (or death, in the case of Joey) and continues to effect them. She might return in a game, or in some other fashion, but she might not. And yes, I'm being vague on purpose. Since Blackwell Legacy is selling well on several casual game portals, can we expect to see Unbound taking the same distribution path? Haha. Legacy is only on two portals for now (and about to go on a third), and the game has done very well. So well, that they are willing to take Unbound as well. You'll see it on iWin and Playfirst. No deal has been signed with Big Fish yet. Playfirst even wanted to try selling Shivah, which came as a pleasant surprise! You price your games according to content, which is understandable. What we'd like to know is, how much should we expect to pay for Convergence? Or is this undecided yet? As of right now, I'm pricing it at the same level as Legacy. I.e. $14.99. Things might change by the time it comes out, but that's what I'm aiming for. Are you going to make a game in a different genre during the production of the entire Blackwell series? Or perhaps I should just ask... when is Shivah 2 coming out? More than likely! I get the feeling that I'll get a bit burnt out on Blackwell eventually, and I'll need to take a break and do something else just to refresh. I know that if I ever do that, I'll always return to Blackwell eventually. I've been plotting this story out for four years and don't plan on giving it up. As for Rabbi Stone, I want to bring him back, definitely. 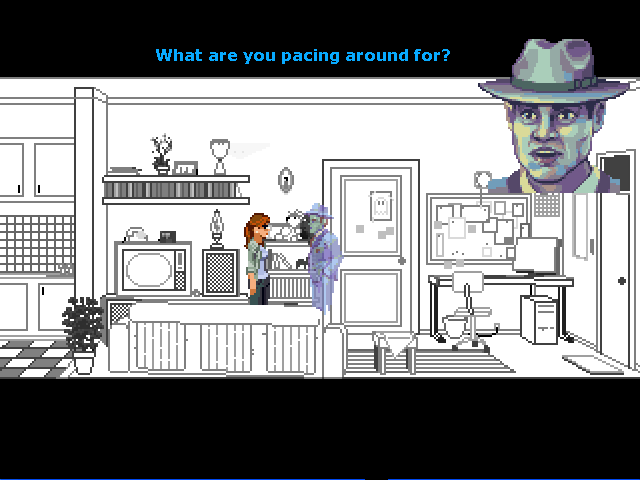 I spoke last year about doing a sequel before doing the second Blackwell game, and I never ended up doing it. To be honest, I was only going to do it because of the public demand for it and not because I had anything really stellar in mind. So, I'm glad I never made it. Over the last year I've been thinking about Rabbi Stone in the back of my head, and I've come up with a very nice story arc that I think people will like. But I know that if I DO bring him back, I'll want to do it right. So for the last several months I've been talking to venture capitalists and investors and People With Money to see if anyone wants to give me a few dozen grand for the cause. The original Shivah really springboarded this whole Wadjet Eye thing, so I figure if there's any IP that can attract potential investors, it would be Rabbi Stone. Of course if that never pans out I'll probably bring him back anyway. Will you be retaining the same development team from Legacy and Convergence for the fourth and fifth game? 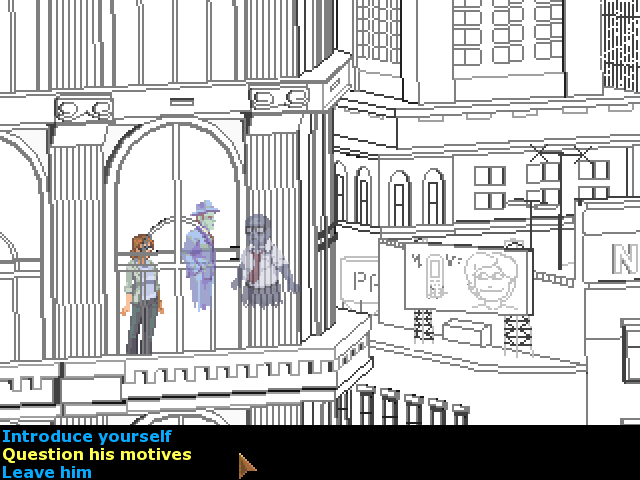 Since your plan includes five games in the Blackwell universe. The dev team changes, depending on the team members. Ian Schaephler did both the sprites and portraits for Legacy, but he's got a very busy fulltime job now and doesn't have the time. So he's just doing the portraits this time. I've got another sprite artist to mimic his sprite style and we go on from there. So the team might change. Tell us a little about your experience working with Erin. 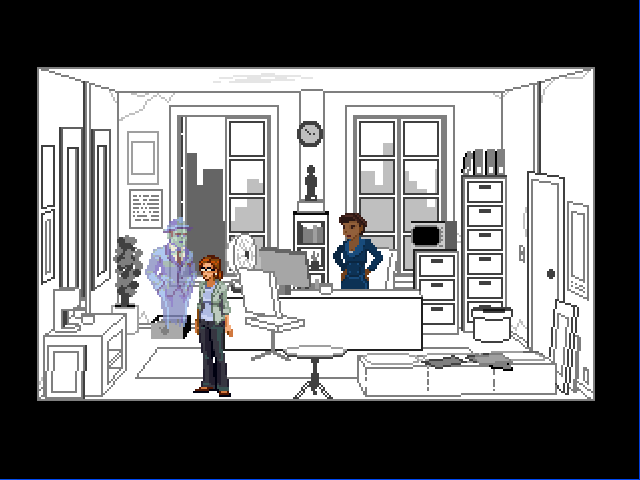 Will you be working with her again on another Blackwell game? And how has the response been for Unbound? Working with Erin was awesome. She was enthusiastic from the beginning, and didn't mind that I made the game a bit longer than originally planned. We'd both be in coffee shops on wifi connections, chatting over MSN like we were in the same office. It was a great way to work. She was ideal for Unbound because the budget was very small and she was willing to work within that micro budget. She's got that "busy college kid" thing to deal with these days, so I don't think we'll be collaborating anytime soon. Although I'd love to, since she was a lot of fun to work with. The reaction to Unbound has been really positive! I was worried how people would react to the change in visual style, as well as a total change of player character. Would they be upset that it was Lauren and not Rosa? Or worse, what if they played Unbound and decided they liked Lauren better! Turns out my fears were unjustified since people generally like both characters. Nobody minded the simpler graphics, although people did miss the character portraits, which won't disappear again. I didn't mind the character portraits not being there. That was the only major complaint about the game, it seemed. Doesn't seem to be much difference, to be honest.. I thought so too! I do think, despite the simpler graphics, that Unbound is one of the best titles - gameplay wise - that I've ever made. Legacy was too bogged down by narrative and didn't have much gameplay. I learned so much from that game, and Unbound became MUCH more balanced as a result. Will Convergence improve upon Legacy and Unbound in any way? I learn lessons from each game, and I try to incorporate them into the next one. The "switching characters" thing will definitely remain, and the dialogs will be quite a bit shorter (although there will be more of them). Also, the one thing I learned from Legacy is Rosa herself. I wanted to establish Rosa as being kind of a social misfit, and I succeeded but you didn't really learn anything about her aside from "I am scared and nervous." Rosa's a very intellectual and analytical person, and I'm going to focus more on those qualities in the next installment. She'll still be a social misfit, but the focus won't be on that so much. Who do you like better? Rosa or Lauren? Who do your fans liked better? And did you base these two characters on actual people? That's a tough question. Some people say that Rosa feels more real and that Lauren feels more like a stereotype, and some say the exact opposite! Personally, I found Lauren more fun to write since her and Joey have a pre-established relationship and I could just launch right into their banter. The Rosa/Joey relationship is more complicated, since they are in the process of getting to know each other. But to be honest, I like them both for different reasons! They aren't based on anyone specific, although they are both very "New York" types of characters. How much of Convergence is already done? Which year do you think the last game will be out, or are you planning to milk it till it's dry? I can't really answer the second part of the question. I'm guessing we'll be following Rosa and Joey around for a few more years at least. Where do you see yourself in five or ten years' time? 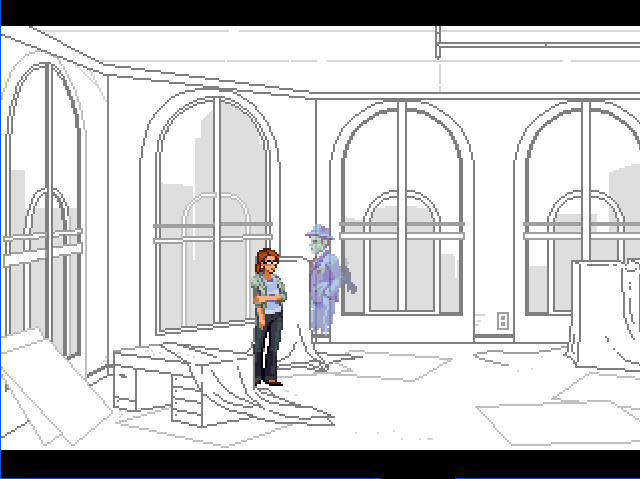 Still working on 2D adventure games? Or trying to finish the Blackwell series? A very good question! I do want to try out other genres eventually. I love RPG games, and even plotted one out a few years ago. If I ever get the budget, time, and (heaven forbid) the staff to make it, rest assured I'll try! The fact that people really like my work - and enable me to pay my mortgage every month - makes me feel very happy. It's a weird life sometimes, but I feel very lucky that I am able to do this. It could be a long ride for some of your fans. Are you really going to finish the Blackwell series, even when you're rich and retired? Or are you secretly working on the final game, so that when you finally call it quits, you can just release it? It won't take that long to finish. Right now, things are slow because I am spending a LOT of time doing the business development and such. haha. yes! It's your fault! Eventually, I hope to be able to afford hiring people to do that stuff for me, so I can create these games a bit faster. Although, from what I understand, one game a year isn't a bad turnover rate. Alright, last question. Can you leak something from Convergence?